Transforming summer fruits into jeweled jars of preserves and jams feels like alchemy to me — a magical chemistry that turns the fleeting pleasure of fresh berries, peaches, and apricots into a long-lasting treat. It's also wonderful to open up your pantry during the winter holidays and take out a few of these gems to give as gifts for friends. With fruits at the peak of ripeness and flavor right now, it's a great time to make jam and preserves, and it's very easy. Really! With only three ingredients — ripe fruit, sugar, and lemon juice — you can distill the tastes of summer into luscious jams. 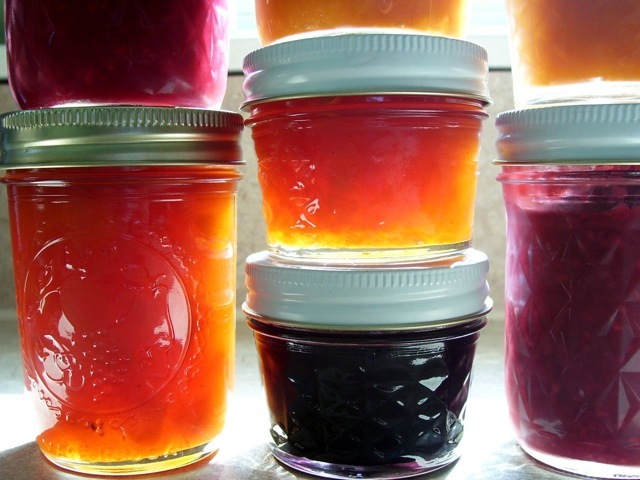 The better the quality of the fruit that you use, the better your jams will be. Since I'm sticking to a lower-sugar diet, I've been experimenting this year with substituting stevia (a natural sugar substitute) for a portion of the sugar in jam. I strongly dislike the flavor of such sugar substitutes as Splenda and Equal, and even though stevia doesn't have that "artificial sugar" taste, I was hesitant to muck up a whole batch of jam by using fake sugar. I needn't have worried, though, because I've been very happy with the results, and no one else has even noticed that they are eating low-sugar jam. Over the years, I've tried many recipes and techniques for making jam, and I've found that the simplest method works best for me. I don't use commercial pectin (a gelling agent for jam and jelly) at all. I don't like the flavor of pectin, and I have found that most fruits have enough natural pectin to gel adequately. Pectin requires a specific range of sugar and pH to set up properly. When you skip the pectin, you simplify the whole process significantly. I generally use about one flat of berries for a batch of jam, or about 25 to 30 ripe peaches, apricots, nectarines, or plums. I give the fruit a good rinse and pick through it for any moldy or wizened bits, discarding them. (A few soft spots or imperfections are fine.) Using my kitchen scale, I weigh the prepared fruit — typically, I have about four pounds, which will make around two quarts of jam or preserves. For each pound of fruit, I add one tablespoon of lemon juice and one cup of sugar. I place everything in a large pot, add a splash of water (about a quarter-cup), and cook it over medium-low heat for about two hours, stirring occasionally. When it starts to look like jam, I drop a small spoonful on a plate and place it in the refrigerator for a few minutes. If it looks gelled, then the jam is ready to place in sterilized jelly jars. If it's still soupy, the jam needs to cook a little longer. The consistency should be similar to ketchup — soft, but not liquid. If the consistency is not right, simmer for another 30 minutes and retest. Place the jam in sterilized jars. You can refrigerate the unopened jars indefinitely. I often can the jams using a water-bath method. When canned properly, jam can be stored in a cool place for a year or more.